New Customers - $10 off $50 with email sign up. 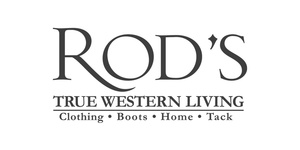 Rod's Western Palace is your source for everything Western: From Women's and Men's Western Clothing (tops, shirts, jeans, outerwear, dresses) and horse tack to unique Western gifts and home decor. We have everything for the horse lover (whether you own horses, aspire to or just admire them) and we can outfit your horse and stable too!